You are here: Home / Lunch / What’s the Scoop? 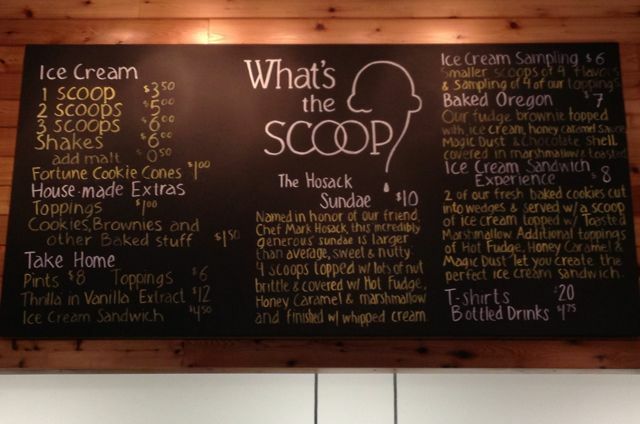 Menu for What’s the Scoop. So many options. On a cold and rainy winter day in Oregon, what’s better than visiting an ice cream shop? I mean seriously, what were we thinking? I guess it’s always a good time for ice cream, right? I had caught wind of What’s the Scoop and learned of their creative way of making their ice cream. Let me save myself some time and just give it to you straight from their mouths. It is a small batch ice cream shop featuring ice cream and sorbets made from scratch and frozen with liquid nitrogen, a process which allows our ice cream to be frozen much faster than with a traditional ice cream machine. The shorter freezing time translates into much smaller ice crystals and an extraordinary creaminess. There are 2 things that stuck out to me when I was there, aside from the way they make it. First off they have a tasting station. Yep, that’s right. Not sure what you want? They will give you samples until you are perfectly satisfied. But what if you already know what you want? Then head straight to the other section where you place your order. Now there is no more holding up the line. Take your time. 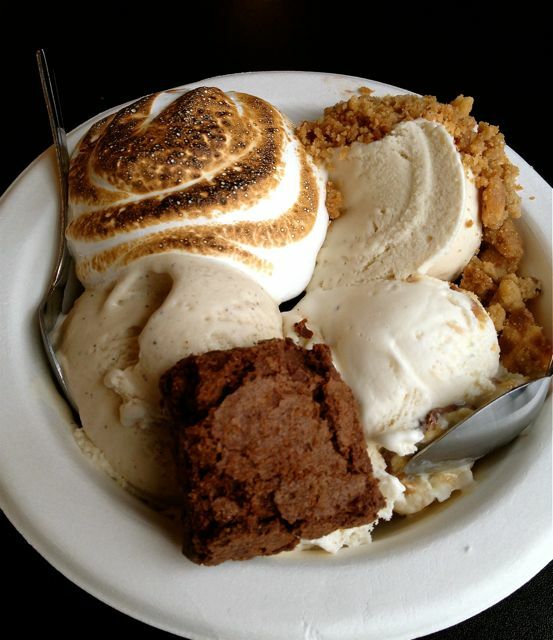 Ice cream sampler at What’s the Scoop? The other thing I loved was the sample bowl. The way we found this was a customer came over and told us we needed to order it. I love when people are so enthused about a place that they jump in and help you make a decision. You could tell this guy and his daughter were regulars. The sample bowl was 4 different ice creams with 4 different toppings. That’s not even the best part. The best part is, it was only $6 and it was big enough for 2 people. We had vanilla (I know, don’t judge me, I am a sucker for vanilla,) chocolate, coffee and bourbon toffee. I am not a huge fan of toppings so we only tried 2 different ones. We did the toasted marshmallow, because it’s cool and the streusel topping. My favorite was the chocolate, which is weird, because I’m not a huge fan of chocolate, but it was very good and super creamy. Atmosphere was cheery, even on a gray day. They have huge windows, one that opens up during the summer. Service was good. Although we got there right when it opened, so it wasn’t super busy yet. What’s the Scoop is located in NE Portland.